Gandia Spain lies about 100 km north of Alicante along the Costa Blanca. 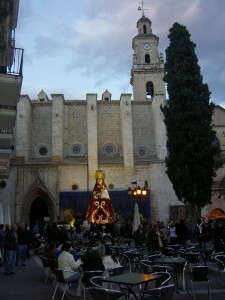 With about 55 000 citizens Gandia is one of the largest cities around the area. You can take the Autovia or National road up from Alicante to Gandia by car, or take a bus from Alicante bus station. With near endless fields of orange trees around, Gandia is somewhat the center of agriculture for the area. Together with a large fishing business due to its harbor, the city also offers very interesting places to visit. Due to the fact that most of Gandia’s city center is full with palm tree promenades with bars, restaurants and shops along, it is also a wonderful place for a shopping tour. Being one of the largest cities around, Gandia attracts many tourists just for shopping. With a huge shopping mall area outside of Gandia, major supermarkets and stores can be found. (Carrefour or Aldi just to name a few.). Apart of shopping for daily needs, Gandia is also an interesting place for sightseeing holidays. One major tourist attraction is the Palace of Santo Duque just at one end of the old city center. The building, with many different influences over the past centuries, is famous for its patio de las armas and a huge stairway. It has been declared a spanish national monument. Really worth a visit. In addition, while you are in Gandia, you might want to visit the church La Colegiata at the plaza de la constitucion.and the old university building Antigua Universidad. A little bit to the south of Gandia you find the city of Oliva with a beautiful old town center, which you should also visit. One main attraction of Gandia is its sandy beach. With a length of about 11 km it is the attraction, particularly for tourists from Spain or other counties. With a Gandia weather of sometimes over 40 in summer, it is one of the best places to be on a hot summer day. To sum it up, if you want to find a lovely city with a great mix of shopping, sightseeing and beach, than Gandia is a wonderful choice.